The nbresuse extension is part of the default installation, and tells you how much memory your user is using right now, and what the memory limit for your user is. It is shown in the top right corner of the notebook interface. 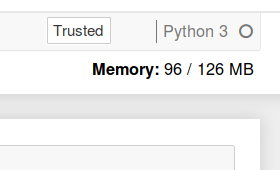 Note that this is memory usage for everything your user is running through the Jupyter notebook interface, not just the specific notebook it is shown on.